I can't remember which blogger mentioned Death by Darjeeling but it both caught my attention and piqued my interest for a multitude of reasons. Chiefly, it was a mystery integrating the subject of tea. I figured it would be hard to go wrong. Death by Darjeeling is the first in a series of Tea Shop Mysteries written by Laura Childs. According to my copy of the book, Laura Childs is a New York Times Bestselling Author. My paperback copy lists thirteen titles in this series and a few notes from reviewers who say that "Murder Suits Laura Childs to a Tea." (Nice.) I'll give it marks for being "diverting" and "entertaining." 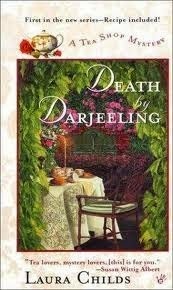 Death by Darjeeling didn't strain my brain and it kept me occupied which is really all I asked of it. I guess that qualifies me as being a satisfied customer in certain respects. Theodosia Browning is the main protagonist and chief amateur sleuth of this series. She owns a tea shop in downtown historic Charleston, South Carolina and has a dog named Earl Gray. (To my friend who loves tea and Charleston, yes, I was indeed thinking of you while reading this book.) She is a single gal, and capable business owner who is open to romance if it should come along. In this particular story she finds herself stumbling across a murder during a Lamplighter Tour hosted by the local Historical Society. The victim is found dead alongside (gasp!) 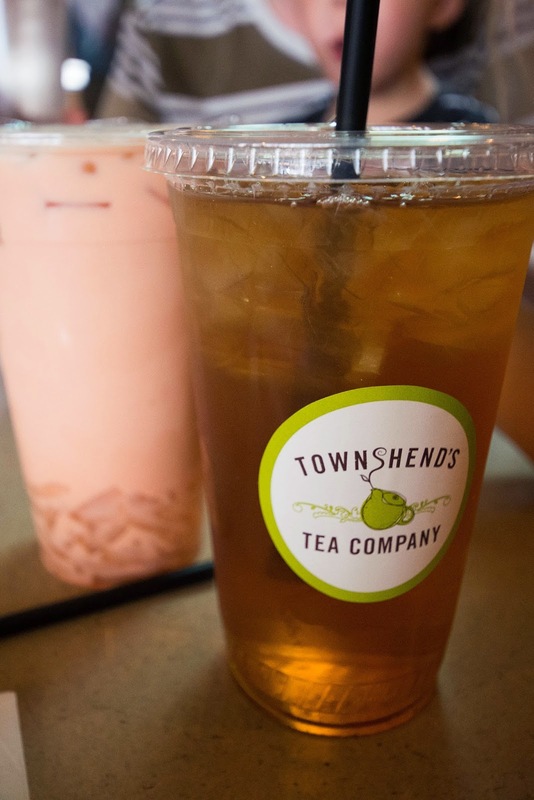 a cup of tea, a specialty brew created for the celebration. Theodosia and one of her employees is being investigated for foul play and she is eager to vindicate them both. Thus begins her sleuthing career. Truthfully, I have to tell you that I was not wow-ed by this book. Yes, it hit on several of my loves: history, beautiful settings, and tea. The problem for me is just that I found the book to be "ok" and not much more than that. To my reading audience who enjoys a light mystery and these same themes in books, do be aware that there are about half a dozen foul words scattered throughout this book. They are not concentrated in an any particular area but sort of creep up on you. I wish Childs would have kept her language entirely clean, for if she had I could recommend this book without hesitation. My other problem with Laura Childs comes about as no real fault of her own. The last mystery I read was by Dorothy Sayers and I was simply blown away by Sayers' ability to weave intellectual arguments amid her mystery. My impression of the Tea Shop Mysteries (and so many other modern mystery series) is that the authors wish to peddle stories out quickly and pigeon hole into a genre that can be easily digested by modern readers. There was not a lot of suspense involved in Death by Darjeeling and no terribly deep thoughts. I know that's being a bit harsh and unkind and I don't necessarily mean to be either. I just don't feel that Childs writes as craftily as, say, Du Maurier or Sayers. If I'm going to read a mystery I want it to be a really good one. If I want a light mystery I tend towards watching sitcoms and that gives me my "mystery quick fix." (I've long been a fan of shows like Matlock, Murder She Wrote and, more recently, Monk or Castle.) If I want to read a mystery, I favor those that are complex and thought provoking. To end on a positive note, I think I would like Laura Childs in person. She loves to travel, she loves to read, and she loves to drink tea. Her husband is a professor and the two of them have spent a lot of time in Japan and China. She clearly knows a lot about Charleston and is a lover of beauty. I think she would be a fascinating and fun person to spend time with which is why I don't necessarily regret reading the book (although I probably wouldn't seek out any additional titles). Now, I have a confession to make. I had never tried Darjeeling tea before this book and in the reading of it I felt a sense of guilt rising up. (I "do guilt" really well.) I determined to locate some and give it a try. Lo and behold, on our travels we ran across this downright amazing tea shop which I gushed about over here. I tried Darjeeling as a nod to the book (and enjoyed it). So thank you, Laura Childs, for coming along on my recent journey and for encouraging me to try something new. I appreciate that. I have the first six books in the series on my bookshelf. I read the first 2 or 3 and pretty much agree with your assessment, which is why I've never made it back to reading more of them. I've been feeling like I should recently, so thanks for reminding me that there are better mysteries out there. Barbara Ross is a mystery author I think you might really enjoy. She writes the Maine Clambake Mysteries. While they wouldn't measure up to Dorothy Sayers, they are very enjoyable. The first one starts a little slowly, but once it gets going, it never stops. I've read and own everything of Dorothy Sayers mystery books. She was the best. I only read older mysteries, nothing modern can compare. I have Pinterest boards for all my favourites. I may have been the one that mentioned these - they have been my go to every now and then when I want a mystery to read and I do enjoy them probably because there is no deep thought involved. I've tried her other series and didn't care for them but have stuck with the tea one and check the newest one out periodically from the library as I spot one. I don't know if I've read a Dorothy Sayers mystery, but I was ALL ABOUT Agatha Christie once up on and time and I need to revisit her one of these days soon. If you haven't read Murder on the Orient Express you need to, stat. PS. I used to love Murder She Wrote and Matlock as well and I do think that Childs reminds me of their type of mystery so maybe that's another reason why I enjoy them. Reminds me of watching those shows with my folks. I do agree that she writes like a tv show. I can see why anyone could sit down and enjoy a Childs mystery. (Ha...that sounds funny.) I guess it boils down to, if I want to delve into a light, easy mystery, I'd rather watch a screen. I agree, it's really hard to find a GREAT mystery--especially one that's clean. I do need to check out Dorothy Sayers. I have to admit I love mysteries, even light ones. Of course, I've been keeping my reading SO light that lately it's all about middle grade books. (Pfft...Like I've ever been super challenging on myself!) :P I do love Christie's books, though. Either way, I'll skip this one due to the profanity. For some reason, I thought you loved the Flavia books. I'll have to read your review again in a moment.